Aerofil Technology Inc. (ATI) announced the completion of its new high-speed aerosol production line. 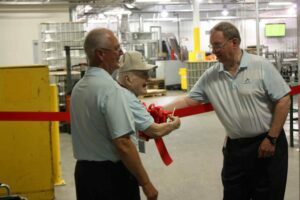 To support the new production line, Aerofil purchased a 30,000 square-foot warehouse that sits directly across the street from their existing facility. The new line and warehouse will create hundreds of jobs in the St. Louis area. 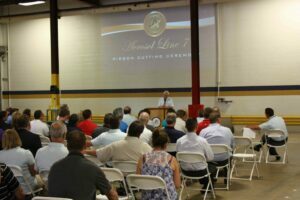 ATI hosted a ribbon cutting ceremony on Sept. 21, 2016 to commission Aerosol Line 7. 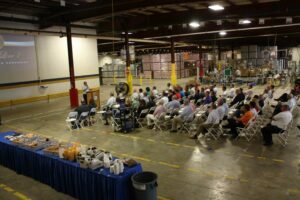 In addition to almost 100 of ATI’s valued customers and suppliers, the company welcomed Missouri State Representative Dave Hinson, Missouri State Senator Dave Schatz, Deputy Director Brendan Fahey representing U.S. Senator Claire McCaskill, and Deputy Director Jim McNichols representing U.S. Congressman Blaine Luetkemeyer. “Another series of exciting significant financial investments demonstrating our long-term commitment to our employees, the City of Sullivan and surrounding communities, and most importantly to our customers,” stated Pat Bergin, President of ATI. A 5-year, quarter of a billion dollar contract was the catalyst for the new high speed production line and warehouse. The expansion has led to an immediate hiring opportunity for nearly 50 hourly employees, with an additional 50 positions to come on board as additional shifts are added during the ramp up phase of production. As part of their strategic growth plan, ATI also announces the purchase of two additional high-speed aerosol production lines, which will be commissioned in early 2017. Aerosol lines 8 and 9 will create an additional 100 positions, bringing the ATI workforce to well over 600 Missourians. In 2017, ATI will have nine aerosol packaging lines, three liquid packaging lines, and 560,000 square feet of workspace.